I know, it’s a little dreary isn’t it. I’m in Grove City, PA. I’m meeting my girlfriends here for a shopping trip, but I came a day early to get some writing done, have a bit of a baby free breather. But I kind of forgot that that meant that I was going to be alone in a hotel room, and I’m not good at being alone, and I haven’t slept alone in a hotel room since before I was married, so I tossed and turned all night – I look like a nightmare this morning. I’m at the Best Western, which is right across from the outlet center, so that is terrific. The hotel itself is probably a B, it’s clean, but small, and dated, and I feel like I can hear everything that is happening in the whole building, and the people across the hall are assholes. It’s also raining, did I mention that. It’s kind of adding to my droopy demeanor. Boy, I’m Debbie downer today! I’m sure this is frustrating to everyone, especially my husband who is home with the kids so that I can have some time away to recharge. 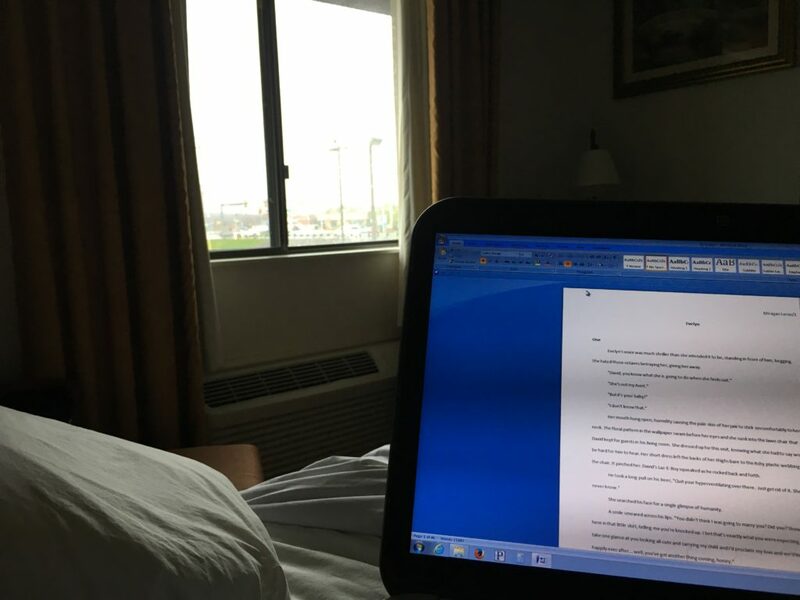 I just need to buckle down and write something, but having the entire day to do nothing deprives me of a deadline, and therefore motivation, and I just sit here, looking out the window and listening to the rain (and the housekeepers in the hall). How do you get good at being alone? Practice? I don’t really understand why this happens to me. I’m a pretty independent person, I like being alone in small bursts. But when Josh goes away and I have a quiet house from 7:30pm on, the same thing happens. I get sad, and twitchy. Soon, my friends will be here, and my friend Trace is bunking with me, so I don’t have to sleep alone and I can stop being such a baby.